My Inbox looks ridiculous right now and yeah, that’s about it. I had a really neat opportunity last week, that I’ll talk about more at some point, but it took a lot of thought and some time, so I found myself in a bit of deficit when it came to spare brain cycles. Plus my wife had gone out of town for her semi-regular pilgrimage back to her dayjob employer, so my workday was compressed and my evenings a little more chaotic than normal. Plus there’s been the tragicomic search for a house. I swear, if I hear one more time, “Bad news… there’s nine million offers on that house already…” I’m going to scream. Ironically, there’s a bunch of houses we could have, but we don’t like them much. Apparently no one else does either. Which makes me think the current environment is some kind of bizarro blend of a buyer’s and a seller’s market. (Seriously, there’s like 10-15 properties we dismissed that are just… lingering out there right now.) It’s a seller’s market for people with granite countertops in their kitchens and fresh paint everywhere. For people trying to sell something with a lot of paneling or wallpaper… it seems to be trickier. But that’s it for excuses. Today I get things back on track. Yeah, I wanted to try blogging every day, but that just didn’t work. For, you know, reasons. One of the big ones was that I was actually successful in getting some fiction writing done on my lunch hour. Pretty sweet, right? Right. As is typical for me, I have a dozen things I’d like to be working on simultaneously, but with kids and a day job, that’s kind of tough. I have the time/energy for one thing at a time, though I suppose I could refine the process a little, if I could perfect switching gears on command. I’m also trying to read more, of course, which makes it tricky, too. I’m still meandering through The Long Earth by Terry Pratchett and Stephen Baxter. It’s been good so far, but like with everything, if I just sink into it, then nothing else gets done, including this. And yeah, this might not seem as important as, you know, reading, but I find it rather useful. Life, otherwise, has been life. Work, wife, kids, house hunting, convention planning, theatre planning, and so on. Went to a convention planning party on Saturday, and that was fun as far as it went. But I do wonder if I’m not burning out on it a little. I guess we’ll see how I feel in the fall as we start to ramp up to the convention. I know a lot of people who do convention planning say this, but… I’m wondering if I wouldn’t enjoy just attending for once. It’s been a while since I did that. Anyway, I found myself disagreeing in two parts. In one case, despite having a hate on for the “out of retirement” trope (Is that on TV Tropes? I dare not go look…) I disagree because it makes sense from a meta-storytelling perspective. Especially, let’s say, in the Star Trek reboot, which Ferrett references. It is actually shown that Spock is off doing stuff and has been all this time. (He’s got his own little ship! Red matter!) But it’s also useful to at least imply he’s being pulled out of retirement because, for the audience, that’s true. There haven’t been ongoing adventures (for the most part, tie-in novels aside) for Spock or the rest of the crew. They are effectively retired, so it creates some resonance when the character is brought back to us if the character is being brought out of cold storage within the universe. I was all set to say just that when I got to the end of the post and Ferrett mentioned the announced, canonical tie-in novels, and how he was sure those wouldn’t figure in. On the whole, I’m sure he’s right. They won’t even have time to reference much in them, if anything at all, and still serve the main story. Yes, having them reference stuff can add some depth and resonance. When used as it was in the first movie, reminiscing about the lost, it worked well. When it was used in the prequels, however… well, there it went horribly wrong as Mike Stoklasa pointed out in his Mr. Plinkett reviews. There it was used simply to stand in for character development of Obi-Wan and Anakin and fell utterly flat. Now, we probably won’t need much character development for Han, Luke, & Leia… but then again, we will need a little something to show how they’ve grown and changed over the intervening years. And there are lots of ways they can do that, just as there’s lots of ways to show that they’ve been out adventuring, rather than just lounging around in idle retirement. Just showing the Millennium Falcon, for starters, goes a long way toward this. Do you think that thing was just sitting in the garage for the last 30 years? Pffft. Yesterday, I asked my friend Erin if she was free for lunch. I was in an area where she sometimes works, and I thought it would be nice to get together for a meal beyond the confines of the show. Sadly, she wasn’t available, but she mentioned that she was going through theatre withdrawal. And… yeah. Tonight will be the first Friday in a month that I haven’t been doing the show. I’m tempted to pop in the video and just watch it, just to make the transition out easier. But that’s really just a pale comparison. None of the people, none of the energy, none of the fun of actually doing it, just the finished product. Earlier in the week, I mentioned my feelings about it to some friends and compared it to how a lot of us feel the Monday or Tuesday after a science fiction convention. There was all of this stuff–people, energy, events–and when it goes away, there’s a weird sort of hole there. Because it’s not necessarily something you want to do, or could do on a constant basis, but it makes its own space in your life, and when it’s gone… there’s something missing. Now, as my wife pointed out last night, it’s not as though I’ll have to wait a year for it again, like generally happens with the conventions. By the beginning of May I’ll be backstage, at least, on the next show, and trying out for the one following that in June or July. But it’s going to be a bit of a lull until then. And this is only my first outing, as I’ve said, in a long time away from the theatre. It’ll be nice to maybe start to work into a regular rhythm, activity and rest, that will ultimately help smooth over the immediate post-show letdown. And even if it doesn’t, I’d rather do the shows and deal with the letdown than never do the shows at all. 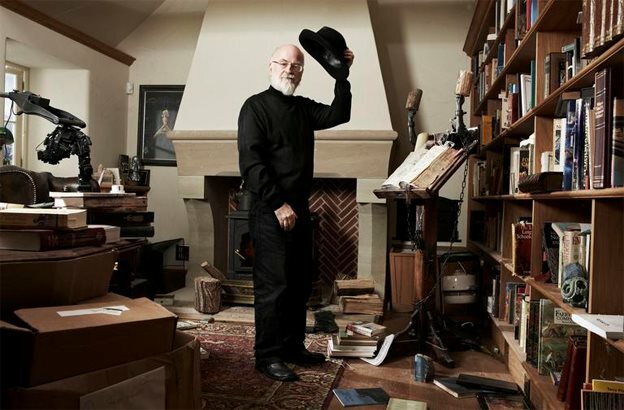 I first encountered the Discworld novels thanks to my sister, who had bought a couple of the Corgi paperbacks (somehow) when she was in high school, I think. I borrowed a couple of them and read them during a summer in college, I think before my senior year. I wasn’t, strangely, immediately hooked, but that did come along. I still haven’t read all of them, but that’s mostly due to time and my own personal laziness. Now, I’m glad I still have some work to discover, and cherish, since it’s officially become finite. I met Terry once, on an escalator in Chicago at the 2000 WorldCon. My wife (then just my girlfriend) and I were headed to some panel or another, and it seemed he was headed to the same place, just behind us. I turned around and exchanged a few words with him–banal stuff like, “Are you enjoying the con?”–while my wife tried to keep it together and not fangirl all over the place. I’m sad I wasn’t able to spend more time talking to him, let it move beyond the banal. But that’s life sometimes. Good bye, Sir, we’ll miss you. So I haven’t blogged the last two lunch hours because I’ve been busy… writing! I know, I know, it’s crazy. Nothing much so far, and mostly it was transcribing from an old notebook, but today was actual new, fresh words. And I’ll probably get to more of them as soon as I post this. (Once people stop e-mailing me.) It’s been nice, getting back to some of the first characters I ever wrote about, albeit slightly changed. I knew I would get back to them eventually, and now seems like the right time. In other news, I’m already getting into the planning for the next show at the community theatre I’ve joined, and it’s been fun chatting back and forth with the director about some set decoration and prop items, which is what I’m handling for this show. It should be a lot of fun, if a little less intense than actually appearing in the darn thing. Definitely a bit bittersweet there, especially since my friend Shaun (one of the new friends I came out of the last show with) will be on stage in this show too. With that said, time to get back to writing, I think. Yesterday was the last performance of “Out of Order,” the show I had been cast in as the lead, Richard Willey. It was… so much work and so much fun, I have a hard time putting it into words. After high school, I really didn’t think I’d act again, and when the kids were really little, it didn’t seem like I’d ever have the time again. But things came together, the wife and I agreed, and off I went to auditions. I won’t gush about it being a transcendent experience; it certainly wasn’t. But it was fun like I haven’t had in a long time, both in the acting itself, and in the social stuff around the show. Meeting new people is always a kick for me, and I’ve met a couple at least that I hope can be friends for a long time, in and out of the community theatre scene. I enjoyed hanging out with and working with everyone on the show, though, and even if I hadn’t made new friends, then that enjoyment would have been worth it. Now the show is done, and I’ll miss it, miss the work, miss the show itself. Thankfully I won’t have to miss the people, at least not very much. I’m sure I’ll be seeing a lot of them quite a bit more in the near future. The other day I was offered tickets to last night’s Detroit Red Wings games and, as soon as we made sure child care was handled, my wife and I jumped at it. It was her first Red Wings game, and my first time back at Joe Louis Arena since the early 90s. 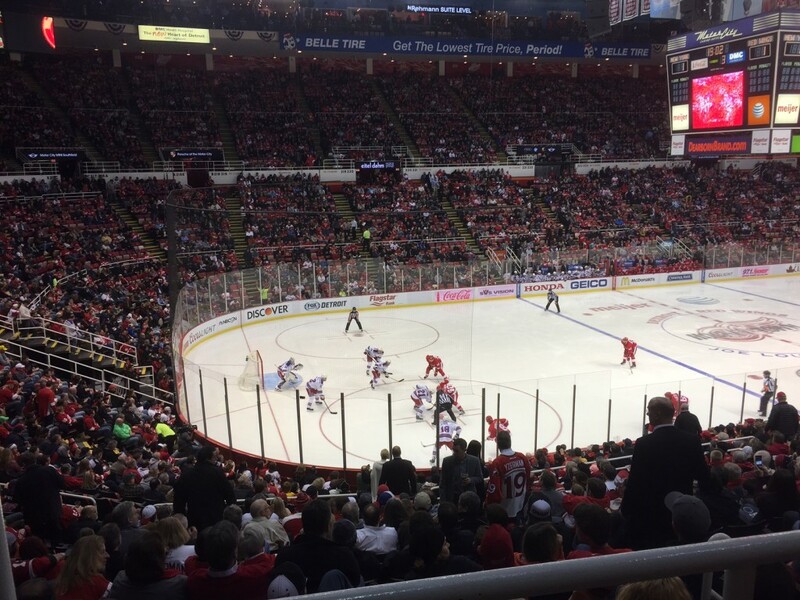 Ironically, it was her first time at Joe Louis since… Saturday when she went to one (of the two!) Garth Brooks concerts there. The seats were absolutely excellent. Second row of the upper-bowl area, with a perfect view down into the corner. The Red Wings were attacking in our end twice, so we got to see a lot of good action, though the game winner (in overtime) was scored on the other end, and I wasn’t even really sure what happened (other than the puck going in the net) until I watched the highlights this morning on my phone. But, it was exciting, and a little bracing in the “walking around Downtown Detroit in the bitter cold” sort of way. The only dark spot on the night was the two young-20s hockey bros behind us providing running commentary. Sadly, it was twice as inane as most color commentary in sports, and they hadn’t practiced pronouncing any of the Slavic names beforehand. Otherwise quite a lot of fun and I’d happily do it again. We’ll see if I get another chance before they build the new arena and shut down the Joe.